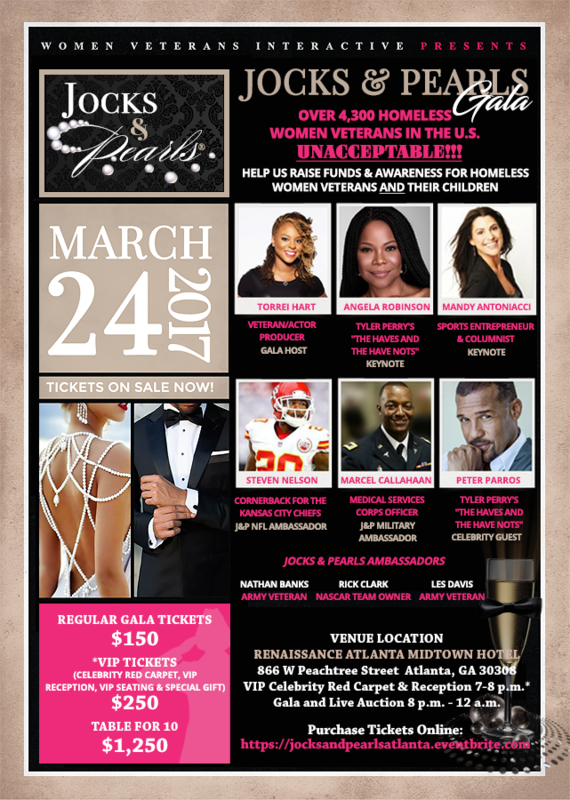 Women Veterans Interactive will host its Inaugural Jocks and Pearls Gala in Atlanta, Georgia on Friday, March 24, 2017. Professional athletes, celebrities and military members will gather for this noteworthy event to raise awareness and funds to support homeless women veterans and their children. The statistics surrounding women veterans are staggering to say the least. Out of 2.2 million woman veterans, 1 in 25 become homeless, 85% of women veterans that leave the military don't feel prepared for the civilian sector, women veterans are more likely to be unemployed than male veterans and women non-veterans, and they also suffer from high rates of Military Sexual Trauma and Post Traumatic Stress Disorder. “The word homeless and women veterans should never be in the same sentence and as a country we must collectively do more,” said Ginger Miller, White House Champion of Change for Women Veterans, Founder and CEO of Women Veterans Interactive. Miller knows the road of a homeless veteran all too well, as she was homeless in the early 90’s after receiving a medical discharge out of the U.S. Navy. The road wasn’t easy for Miller who was taking care of her husband, a disabled veteran who suffered from post-traumatic stress disorder, and their 2.5 year-old son, all while being homeless. In 2015, Centric TV featured Ginger’s story entitled, Get to know Women Veterans Interactive’s, Ginger Miller. Jocks and Pearls is more than a gala, it’s an initiative designed to use professional sports as a vehicle to raise awareness to support the brave women who have served and sacrificed for our country. The initiative kicks off with the Jocks and Pearls Gala-Atlanta, followed by Jocks and Pearls Gala–DC on November 11, 2017, Jocks and Pearls Celebrity Golf Tournaments and Jocks and Pearls PSA’s. This year’s inaugural event is hosted by actor, producer Torrei Hart, who is a woman veteran. “For years I didn’t consider myself to be a woman veteran because I was a Reservist, but that all changed when I met Ginger Miller, the CEO of Women Veterans Interactive. I am a proud woman veteran and want to do my part to make sure that my sister veterans have a place to lay their heads at night. I look forward to hosting this awesome event,” said Hart. 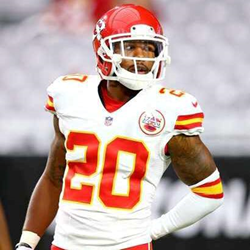 Steven Nelson, Cornerback with Kansas City Chiefs will serve as the first NFL Jocks and Pearls Ambassador. “I was totally unaware that women veterans are becoming homeless at alarming rates and to be honest, every time I thought about a veteran, I would think of a man. I’m honored to be a part of the Jocks and Pearls initiative to help raise awareness and funds for homeless women veterans. To assist with raising funds, I am donating a signed autographed jersey for the Jocks and Pearls silent auction,” said Nelson. Actress Angela Robinson of Tyler Perry's "The Haves and the Have Nots" will deliver the Keynote Address for the gala and Actor Peter Parros, also of Tyler Perry's "The Haves and the Have Nots", will make a special celebrity guest appearance. Parros is the son of a Marine Corps veteran. Other Jocks and Pearls Ambassadors include Army veterans Nathan Banks, Partner, McDowell Information Group LLC; Les Davis, Director of Military Affairs at International Education Corporation; Marcel Callahan, Medical Services Corps Officer; and Rick Clark, NASCAR Team Owner. We are grateful to all of our Ambassadors for assisting us with raising awareness and funds for homeless women veterans. Women Veterans Interactive is a national not-for-profit organization dedicated to serving and supporting women veterans and their families through Advocacy, Empowerment, Interaction, Outreach and Unification. Recognized as experts on Women Veterans issues, our aim is to eradicate homelessness; improve healthcare and education delivery; and develop a network where there is a free exchange of experiences and solutions that will empower and assist women veterans in living full productive lives. Since inception in 2011, Women Veterans Interactive has supported over 1500 women veterans and continues to meet women veterans at their points of need. For more information, visit WVI at Women Veterans Interactive.